When I consider the livelihoods and perspectives of tanuki, tengu, and humanity, I do not usually do so all at the same time. Originally a novel published in 2007, this marks the second time author Tomihiko Morimi has seen one of their books adapted into a television anime format. 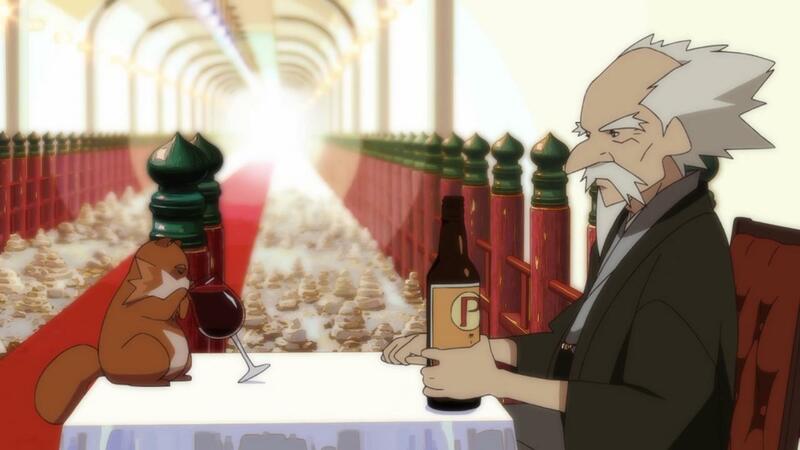 With the first being Masaaki Yuasa’s vibrant take on The Tatami Galaxy (Yojōhan Shinwa Taikei), itself the first television program to ever take home the Grand Prize in the Animation Division of the Japan Media Arts Festival, Masayuki Yoshihara was going to have some rather massive comparisons when attempting to bring another of Morimi’s works to the household screen. Not only this, but his only previous Director roles were for two short projects from 2011 each under thirty minutes in length : Mai no Mahou to Katei no Hi (where a little girl uses magic to understand how other people feel) and Bannou Yasai Ninninman (a story about a young girl who really does not like eating vegetables). Notably, this second program was from the initial round of productions generated as a result of the very first crop of Young Animator Training Project grants, which gives The Eccentric Family a very nifty amount of synergy with my previous write up on Little Witch Academia when considering my favorite anime from the previous year. If even a handful of the individuals given such opportunities by these kind of programs go on to generate more television as well rounded as this, then our industry will be in solid hands for years to come. 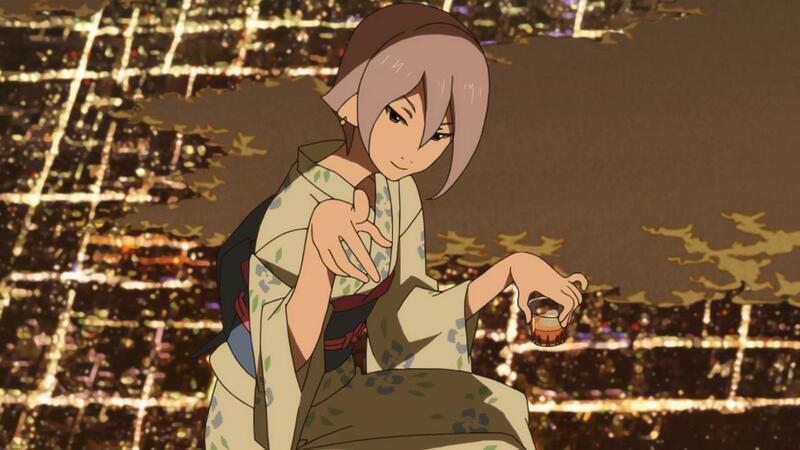 The story of The Eccentric Family is in many respects a story of cities, families, relationships, and how all of these concentric circles play around each other. As mentioned, we have various perspectives in play between humans, tanuki, and tengu characters, and within those their own associations and dynamics within the larger societal systems around Kyoto. To take but one series of examples, we have the tengu Akadama, often referred to as Professor by our many of our tanooki characters out of respect for his age and teachings. As proud entities renowned for their ability to rule the skies over us all, Akadama is a grounded tengu due to injuring his back due to a certain incident. A bitter old man for several reasons, he lives alone in a messy apartment and drinks a large amount of port wine. No other tengu come to spend time with him, as he can no longer fly through the air of his own will. But our lead carefree tanuki in the form of Yasaburou Shimogamo often visits and chats about the day while cleaning things up. The Shimogama family invites him places, and as a bitterly proud and yet lonely tengu Akadama works up various contrivances to actually verbally justify his attendance in what are often incredibly warm bits of dialogue despite the camouflage of disdain. Akadama is not a blood relative, and yet fills every role of an integral yet testy grandparent. At the same time, as the mentor and teacher (and forlorn admirer) to the human Benten, herself a curious attraction of Yasaburou’s, Akadama is responsible for in several respects raising a complete cipher of a young lady whose perspectives of the world are hidden behind so many labyrinthian yet enchanting layers where she is likened to a most perfect kind of predator. Which is especially apt, as someone who has worked their way into a special friday night dinner club which celebrates the new year with eating a tanuki hot pot meal. This is to say nothing of things such as the mother of the Shimogamo family, who lost her husband and now raises four sons as single parent, one of which has run off down the way a little to live as a frog in a shrine well where others share their deepest wishes, pains, and concerns. As tanuki can shapeshift, she at times likes to take on a male persona, while Yasaburou several times morphs into a female form as a sort of misbehaving daughter or sister figure. It is a family of strains and pressures, concerns and fears over things they will not be able to fix themselves, yet trying to hold things together the very best they can in a city that itself contains so much more than merely their own problems. It is a narrative of the families of circumstance and the families of choice, and how these notions intertwine against a backdrop where everyone in a wide metropolitan area would each have their own kinds of tales. It is how individual choices affect more than merely ourselves, and the ripples we may feel on either end of that chain for potentially years after the fact. With production handled by P.A. Works, to say that the show looks nice would be fairly expected. Historically, this has actually been a bit of a trap of theirs: shows with excellent backgrounds, character animation that generally gets the job done against them, and then kind of falling apart in the writing department somewhere along the line (consider their previous adaptation of a proper full novel, the horror title Another, which takes a long time to get going and not so long completely unraveling in the final arc). To that end, humor manga artist Kōji Kumeta (best known for the Sayonara Zetsubō Sensei series) was brought in for character designs, giving everyone a clinically distinct profile yet simple appearance that plays exceptionally well to expression and reaction shots, which is highly fitting for a series aiming to deal so much in the warmth and fears of family and relationships. The backgrounds, often taking on a posterized photo processing appearance, exist in a sort of contemporary fantasy zone where they appear equal parts real and yet ethereal as the characters maneuver their ways across the sets. And for that writing front that has so often been the bane of the studio? Shoutarou Suga was handed overall series composition duties, with a tonally varied resume that simultaneously includes a swath cutting from nearly a dozen episodes of Fullmetal Alchemist: Brotherhood to multiple engagements with the Ghost in the Shell franchise. 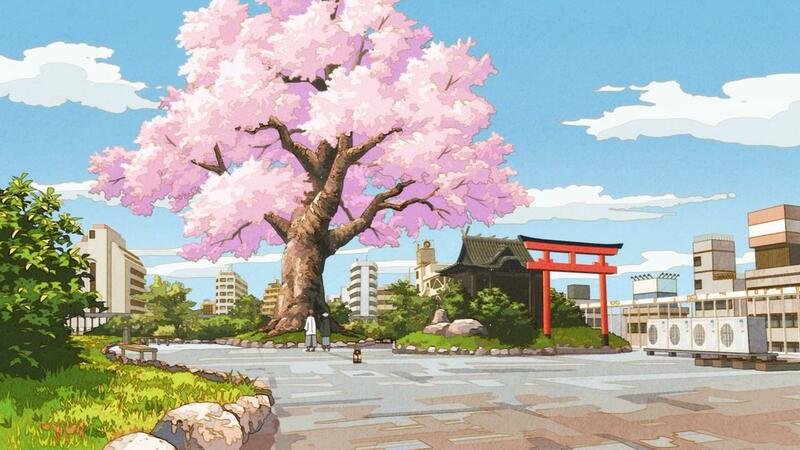 The Eccentric Family is the result of a number of highly disparate parts, from all the varied elements of its staff and crew on through the character dynamics themselves, being forged into a cohesive overall package that manages to work precisely because of how much of a grab bag variety it contains at every level rather than in spite of it. 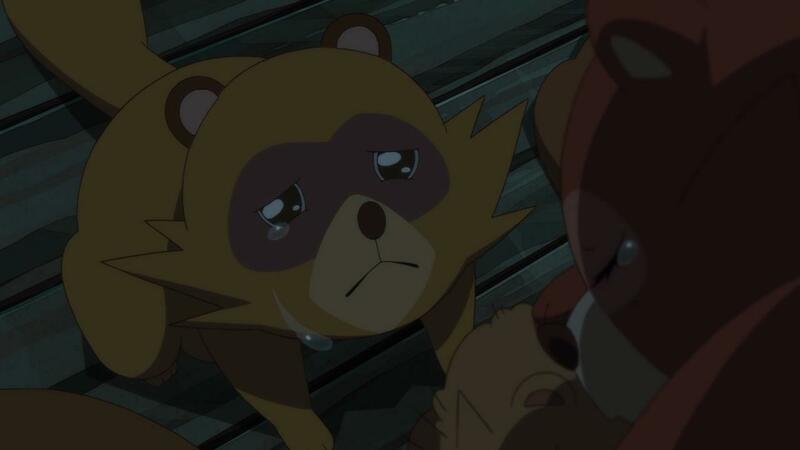 While on the one hand a fantasy story, given all of the tomfoolerly with things such as tanuki shapeshifting and the like, it is all at once also a very identifiable tale. It is very human, despite humans making up only a very few of the actual characters. We are all, in one way or another, in this life together. We have disagreements, we have pains, we have fears, and we cause trouble (sometimes quite intentionally). We act irrationally. Erratically. Eccentrically. But, we are family, on one level or another. The least we can do is try and get along while we occupy spaces in the world. Even if that means trying to figure out on moonlit rooftops if a girl like Benten may literally gobble you up in a hot pot one of these days.